This wintery bohemian wedding was one of my first projects as THE official Sable & Gray, so I thought it would be super fun to do a little throwback Thursday and show you this beautiful and unique celebration. Beth and Luke had a quiet, intimate ceremony that was followed by a cozy and romanic reception, featuring custom place cards with gold pointed pen calligraphy. Something about gold calligraphy always feels so timeless, but combining that look with all of Beth and Luke's bohemian flair really hit it out of the park! I think they might have had a head start on the whole Hygge phenomenom. The Farm at Old Edwards Inn in North Carolina made for the perfect backdrop with its warm and inviting ambiance. The whole reception was lit up by twinkle lights and accents inspired by nature, leaving guests with all the cozy vibes. One of my favorite details of this unique wedding were the funky place settings filled with feathers and greenery, carefully displayed with our custom gold calligraphy place cards. Everything about this wedding felt so one of a kind with all the unique bohemian touches! I am so glad I got to play a part in this beautiful day and help create memories to last a lifetime, not just for Beth and Luke, but for Sable & Gray too! As one of our first official clients, it felt so sentimental looking back at this celebration! It will always hold a special place in my heart, especially after spending an entire weekend diving deep into the roots of Sable and Gray at the Hygge Retreat. It's refreshing to reflect on past projects while moving forward on this journey! Can't wait to share more soon. 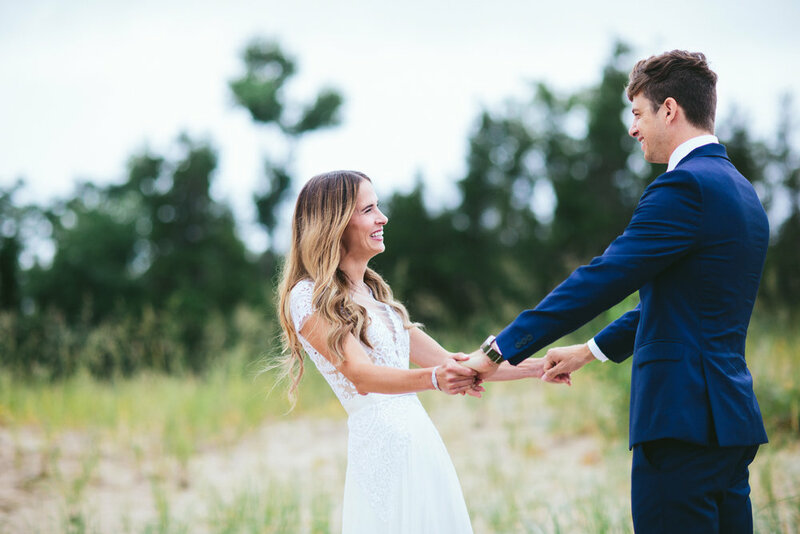 Planner: Becca Knuth, Asheville Event Co.
On a beautiful summer day at a private estate on the Leelanau Peninsula, Kristen & Keenan said their vows surrounded by close family and friends. Their wedding, which was coordinated by Chandra of Orchestrated Grace, was the perfect mix of bohemian and classic with just a touch of modern accents. The soft jewel tones and mix of textures seen in the mix-matched bridesmaids dresses were carried throughout the wedding decor, from the flowers trimming their wooden altar to the throw pillows at the reception. We had such an incredible time working with Kristen and Keenan on their custom wedding invitation suite, which featured hand-painted watercolor floral details, watercolor washes, and a mix of neutral matte and metallic envelopes to add a subtle texture to the suite. Congratulations Kristen & Keenan! Thank you so much for allowing us to be a small part of your big day, and we wish you many years of happiness to come!